Gamestop listing of up coming Godzilla toys. I assume the first and last are NECAs but the other ones are interesting. I'd assume the 12 Final Wars and MechaG are the Bandai but I'm curious what the cheaper two packs are. Those have been previously revealed on Entertainment Earth, they're reissues of the SD Godzilla figures that got released in 2014. Got something new today! 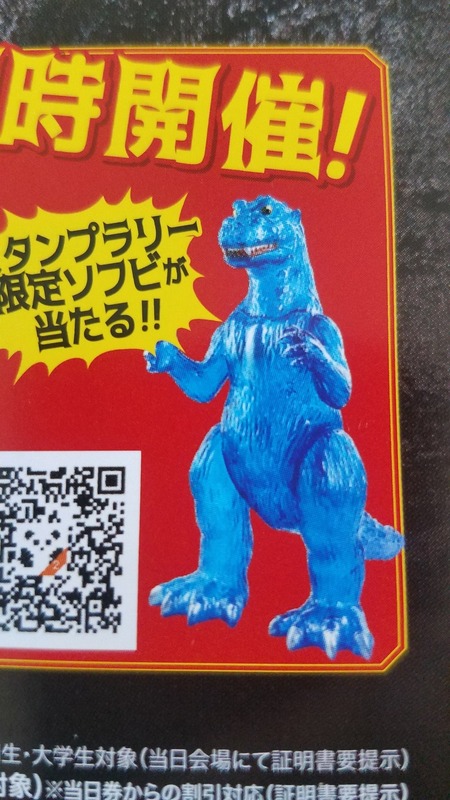 A picture of the Jakks Godzilla was released, not sure the source. Much smaller in size than the 2014 Jakks Godzilla, which makes sense in a post-Toys'R'Us world that no one wants to carry a figure of that size. Similar sculpt though, but with the KOTM spines. Maybe this scale means we'll get the other kaiju too. All of the other Godzilla 2019 Jakks toys are visible here (potentially spoilery one is hidden but clickable, be warned). 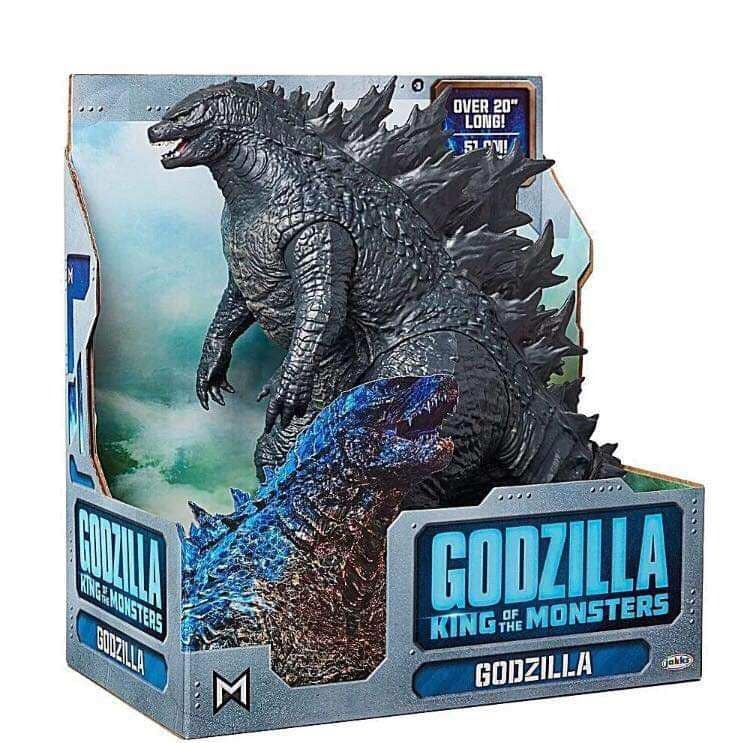 https://www.kaijubattle.net/godzillaleg ... s-revealed This includes the fact that there actually is a return of the jumbo Godzilla vinyl after all. Is it weird that GKOTM Jakks toys have the same boxes/packaging design like KSI toys from Lanard toys. I really like the look of Jakks line. My only problem is a question of the figures' scales to one another. They're reissuing that huge Godzilla from 2014, making a still pretty big new Godzilla that's about half that size, 6 inch Rodan and King Ghidorah, and 2 packs with presumably smaller scale figures that feature all four kaiju including several variants of Godzilla. I hope they have a 6-inch Godzilla and Mothra in the pipeline, right? Otherwise, only by buying the smaller figures in the 2 packs can a kid get all the monsters in the same scale. I was definitely scratching my head a bit at seeing the 6" line without a corresponding Godzilla. What also had me curious is that it looks like Jakks actually has the master license for KOTM specifically? There's no sign that Bandai America is actually doing anything for the movie, just cheap rehashes of older toys (6" King Ghidorah and King Caesar vinyl reissues, the 12" stuff, the SD figures). Toy Fair can't come soon enough, because I'd really like answers. Hopefully the smaller scale " Large" Godzilla means the other TItans in the same size scale. I can understand the jumbo-sized Godzilla figure, since he is the star and all, but at the very least all four main monsters should be represented by the line of 6 inch figures, right? I highly doubt what we've seen is the entirety of the line. I'm sure the other monsters are in the 6 inch line and I suspect the new "large scale" Godzilla has been scaled down from the absolute beast of a figure (that's still getting re-released) so they can make reasonably priced large scale figures of the other kaiju. We also know that what we've seen from jakks was leaked first, to which they then gave official approval. I'm sure they haven't released what they've managed to keep from leaking yet. 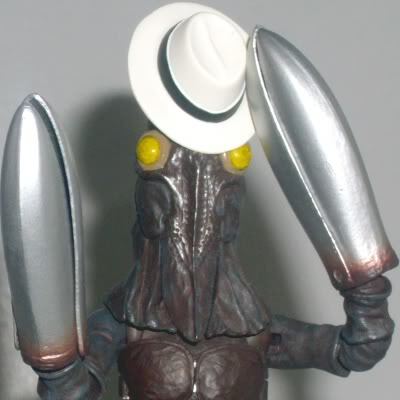 Plus, don't forget we know NECA is making all four monsters in 6 inch scale, the SHMA figures (also 6 inch scale) have also been shown, and I bet bandai Japan will be making vinyl figures for the MMS line. This first variant is a lottery figure related to the Tokusatsu DNA exhibit. It is limited to 20. A 60cm tall remote-controlled, Yuji Sakai-sculpted Godzilla '54, coming piece-by-piece, weekly. At 80 "issues" planned, and a price of 1990 yen each "issue"... yikes. Wow, that’s really neat. At today’s exchange rate that’s $1461.77 over the course of 18 months, or $81.21 per month. The shots of it in motion make me wonder just how mobile it will really be. Doesn’t look much more mobile than the old Marui RC Godzillas. But dang, 60cm? That sucker is gonna be HUGE. So, a lot of stuff was revealed ar ToyFair and I'm not quite sure as to what is for domestic release and what's for Japan. I think these mystery minifig releases are for America? 2 varieties: for the new Hollywood movie, and a classic Toho batch! I'm also seeing speculation that many Japanese Bandai Godzilla figures are going to be released in the US as part of the Bandai creation line, including Shin Godzilla and Godzilla anime products, but besides pictures of these displays without context I'm lacking... any context as to what these are? The small vinyls were candy toys in Japan, and had previously gotten some US releases via Bluefin. This looks as though Bandai US may be doing something more mainstream with them. The huge anime Godzilla is a real surprise! Shame we can't see the card clearly. Saw the new King of the Monsters line at Walmart today! Not really my bag in terms of what I collect, but they looked fun and had awesome packaging and it was just really cool to see this nice display loaded up with Godzilla toys in the country's most popular retailer! Now, if I was a kid I would go with the minifigure packs to get all the main Kaiju (plus two variant Godzillas). Of course, if one were limited to just one toy than the big Godzilla is the way to go. Interestingly, besides the usual Godzilla circle stamp and the Legendary logo there was also Toho's 65th anniversary logo on the back. Pretty neat to see that in the wild! We have an SSSS.GRIDMAN vinyl kaiju coming in at last! Release is scheduled for August. It's a bit pricey for what it is, at $25-30, but at least with CD Japan, you can cut the price down further with rewards points if you have an account. I say preorder this, and show there's interest for more!